The Working Girl's Shoe Closet: What Would Project Runway Shoe? Episode 11: Poison Ivy, Working Up a Sweat! Oh the drama! We got it served up with a side of karma last night. This week’s challenge was to create a look to be added to Heidi Klum’s new line of active wear, Heidi Klum for New Balance, #HKNB. In giving the designers an additional two looks to present on the runway, they brought back all of the designers that were sent home this season. Instigating more drama and looking for vindication it seems, Ivy kept talking smack to the other designers about how she called out Michael C. for his cheating. She says, “I definitely believe in karma” and the gracious editors quickly cut to Ivy screaming, “AAAAGHH!” where she got poked in the eye by something. Tim Gunn then has the designers gather ‘round and puts a kabash on the issue and tells them it’s a non-issue so work, work, work. And work it out they did! They turned out some really very innovative designs with active wear. I think this was pretty hard considering it’s a rather limited genre of clothing. There were definitely a few pieces in each of the designers’ collections that proved they have the talent to still be in the competition. Karma made another appearance to give Andy the win with his chiffon accented asymmetrical pieces. The looks grew on me as I looked at them more and more, especially as separates. Sadly, Christopher was sent home. Check out all the designs here: Project Runway on LifetimeTV. 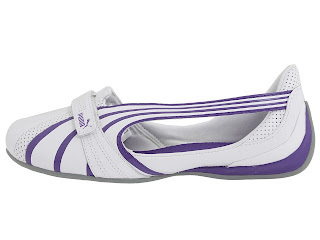 When thinking of great shoes to match with the winning looks, I instantly thought of the Puma ballerina flats with the patent and shiny fabrics. (I had to go with the cat to keep up with all the cattiness! ;) ) I picked three of my favorites that go with all three of Andy’s great looks. 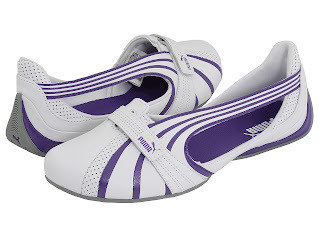 The first is the Espera II in white with violet. The swoopy strap design compliments the asymmetry of the chiffon strips nicely. The pop of violet adds a little color to the white, grey, black color scheme. These are on sale for $63. The second is the Sabadella in black patent with mesh fabric and a little suede as well. The shiny patent finish on this ballerina flat elevates the outfit from looking like you just left the gym. The airyness that the mesh offers goes with the easiness of active wear and reflects the stylishness that is inherent in Andy’s designs. These are on sale too for $42. Lastly, I’m loving the Saba Sequins Ballerina Flats in the aged silver/metallic silver. Adding the bling with the sequins really steps up the active wear look to ensure that your outfit never enters the frumpy galaxy. I think that the shiny sequin ballerina flats truly go with this type of activewear. The fashion forwardness vibe really needs a shoe that can bring that same level of fierceness without being too much. Currently, these retail for $75. I’ll meet you at Amazon.com where we can buy all of Andy’s winning looks as part of the Heidi Klum for New Balance collection. We're nearing the last of the runways and next week determines who shows at Fashion Week. Let the nail biting begin! Those Saba Sequins look great & super comfy!! I may have to try a pair!! 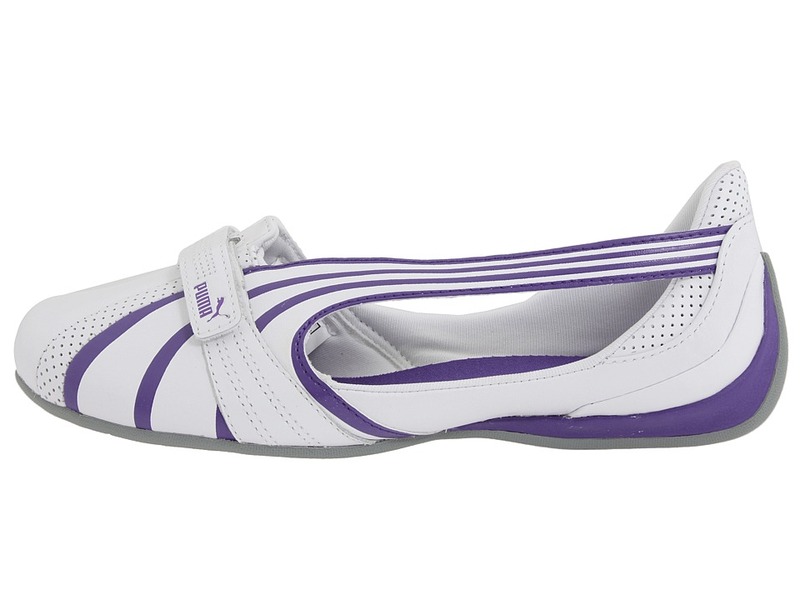 All 3 provide all day comfort with a feminine style. They're great for any girl (or guy) on the go. Shoe Gal Had A Little L.A.M.B.